178 pages | 31 B/W Illus. Andrea Ceron is Assistant Professor at Università degli Studi di Milano, Italy, where he teaches Political and Administrative Systems, and Applied Multivariate Analysis for Social Scientists. His research focuses on intra-party politics, quantitative text analysis, media bias, and social media analysis. He has published a dozen of papers in international academic peer-reviewed journals like British Journal of Political Science, European Journal of Political Research, Party Politics, New Media & Society, Electoral Studies, Social Science Computer Review, Journal of Language and Politics, and others. 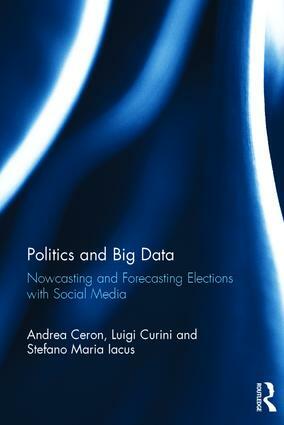 Luigi Curini is Associate Professor of political science at Università degli studi di Milano, Italy, where he teaches Political Science, Applied Multivariate Analysis for Social Scientists, Game Theory, and Analysis of Political Institutions. His research focuses on party competition, spatial theory of voting, and social media analysis. He has published over 30 papers in international academic peer-reviewed journals like Comparative Political Studies, Journal of Politics, British Journal of Political Science, European Journal of Political Research, Public Choice, Party Politics, European Political Science Review and many others. Stefano Maria Iacus is Professor of mathematical statistics and probability at Università degli Studi di Milano, Italy. Member of the R Core Team for the deveolpment of the R statistical software. His fields of interest include computational statistics, theoretical statistics, inference for stochastic processes, text mining and sentiment analysis, and causal inference. He has published over 50 papers in international academic peer-reviewed journals.